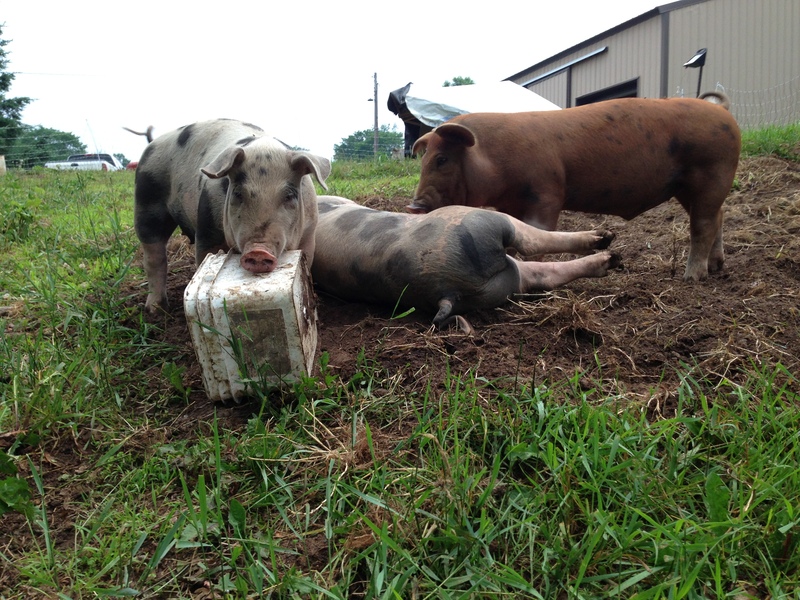 Our hogs, like our chickens, are grown out on our pasture. These guys spend their whole life on our farm from farrow (term for pig birth) to finish. Our breeding stock have a mixture of heritage breeds including Mangalitsa, Red Wattle, Duroc, and Hampshire. The grain we feed them is soy free and free of Genetically Modified Organisms(GMOs). We regularly grind the grain ourselves from locally sourced grains and supplement with mineral from Buckwheat Growers of Wadena. Fresh feed has really increased the quality of our animals. They are modified to be resistant to an insect pest. These crops are touted as beneficial because they reduce the use of chemical insecticides. The problem is that the crop itself has become a insecticide! If you look at the seed bags of these crops they have an EPA pesticide registration just like you would see on the side of a can of Black Flag Wasp Killer. Whole or Half Hog Specifics and Cost Estimates: We sell our hogs whole or in halves. Our price includes the cost of delivery to the butcher and delivery to you. Our price is based upon hanging weight which is the weight of the pig after slaughter. We aim for a 200 lbs. hanging weight. Butcher fees are between $100-$150 for a half hog and $200-$250 for a whole depending on what you have done (sausages? ham? slicing? etcetera). Estimated final cost for a half hog is $400-$600 and a whole hog is $800-$1000. Thank you for considering supporting our small family farm and careful dominion over the earth with your grocery dollars!